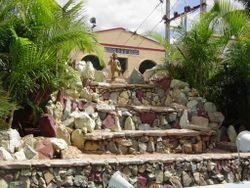 Mantralayam is a town in Kurnool district in Andhra Pradesh. Mantralyam is a Hindu religious place where the Moola Brindavanam of Sri Guru Raghavendra Swamy (1601-1671), an influential saint in Hinduism, is located. He advocated Vaishnavism (i.e. worship of Vishnu as the supreme God) and also the Dvaita philosophy of Sri Madhwacharya. He is considered to be a reincarnation of Prahallada, the devotee who was saved by Vishnu, in his avatar of Narasimha. Shri Raghavendra Swamy is said to have performed many miracles during his lifetime and is believed to continue to bless his devotees to this day and will continue to do so. 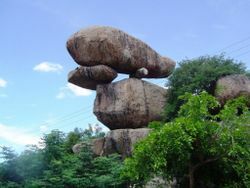 The town is located on the border of Andhra Pradesh and Karnataka on the southern bank of the Tungabhadra river. Most people here speak both Telugu and Kannada languages. You can also find people speaking Tamil. Mantralayam is around 250 km from Hyderabad and the journey from Hyderabad takes about 6-8 hours by road. It takes about 10 Hours by road from Bangalore. To reach Mantralayam from Bangalore,KSRTC has introduced a new bus called "Vaibhav". It is similar to "Rajahamsa". Apart from these,there are Volvo buses("Airavat")as well. If you are driving from Hyderabad, you need to take the NH7 highway in the direction of Bangalore and take a diversion at Jadcherla. Various state roads will take you to Mahboobnagar and then Raichur in Karnataka. 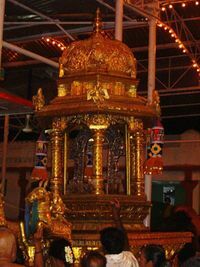 Mantralayam is around 600 km from Chennai. It can be reached through the route of Chittor. It is around 650 km from Mangalore. By road, one can take private buses from Mangalore to Bellary and from Bellary one can get ample number of KSRTC buses to Mantralayam. The journey takes almost 15 hours. The nearest rail head is Mantralayam Road. It lies on the Mumbai-Bangalore, Delhi-Bangalore and the Mumbai-Chennai train routes. Regular rail service is available for this route. Apparently, many trains like Karnataka Express, Rajdhani, etc, stop at Mantralayam Road to refill water, even though the station is not on their official list of scheduled passenger stops. Mantralayam is a technical stop for all long distance trains on the Mumbai-Chennai and other southerly bound routes. Trains stop here to fill up with water, since the station is just near the Tungabhadra river and this is the only source of fresh drinking water on the entire 900km route. There is one train that goes from Hyderabad Deccan station to Mantralayam Road en route Tirupati. 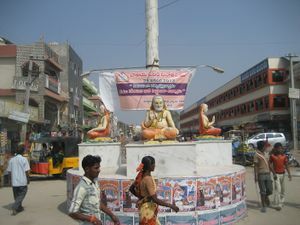 Mantralayam Road is about 16 km away from Mantralayam. You can travel to Mantralayam from Mantralayam Road station by private Jeeps, taxis, auto rickshaws or public bus. Approximate cost of travel per person is ₹50 for private transport and ₹10 for the Public Bus. The place is small enough to be covered on foot. If you drive into the temple complex, there is a charge of ₹15 for parking. The collection of parking charges is inconsistently done, however. Rickshaws are available all over the place. It is a must to wear dhoti for gents and Indian attire like sari, salwar kameez for ladies to enter the sanctum if you want to go near to the Brindavan or do aarthi on your own. A few priests don't let ladies wearing salwar kameez go near the Brindavan, so it would be ideal to wear a saree. 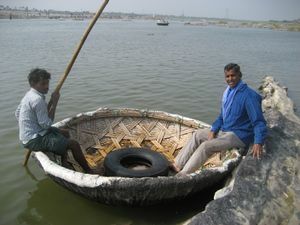 Before entering the sanctum sanctorium of mutt, you are advised to take a bath (or at least wash your feet) on the banks of Tungabhadra river (or at the tap in front of the mutt). Have the darshan of Manchalamma, the goddess who blessed the place for Shri Raghavendra Swamy's Vrindavanam. Then, you need to enter the sanctum of mutt through the queue complex in front of mutt. If you are lucky enough and there's no rush for the darshan, you can enter the sanctum directly (of course, you have to bear with queue of smaller length). After the darshan, you can quietly move around the sanctum chanting the stotras of Sri Raghavendra Swamy or simply chant OM Sri Raghavendraya Namaha. If you are offering sevas exceeding ₹50 you are required to assemble in the seva hall on the right side of the sanctum before 8.00 am. Hence you are required to purchase the seva tickets the previous day. Please note that the seva timings might vary or sevas might be cancelled on auspicious days like Rama Navami, Madhva Navami, Aradhana days and on the days of eclipse. Parimala prasadams are unique kind of prasadams prepared and offered to deity in Mantralayam only which are available in the counters outside the sanctum. Mass feeding of meals takes place in a large dining hall on the left side of the sanctum during afternoons. During nights you can purchase food items like puliogare, pongal from Annadaata counter in front of the mutt by paying a small amount. A new scheme is introduced with the offerings from one of the devotees. During night(sometime after 8PM), outside the temple, they provide two different rice items(rice bath, curd rice) which each plate of rice costs ₹2 only. The quantity as well as the taste is also good. Two plates will be sufficient for one member. Good food is available easily and at affordable places. Please take care, as the cleanliness is missing on various eating places. Gulbarga Brothers, Brahmins Tiffin Center. Next to Mutt Main Gate. Pure Vegetarian Food. SR Tiffins - Fast Food beside the Temple (front view) is good. especially for Breakfast & Dinner. Sri Udipi Krishna Hotel on the main road. This hotel is quite good. There's also MTR just opposite to the temple entrance,but there are no chairs to sit. One has to stand and eat. But the taste is very good. Lodges & Hotels are available in Mantralayam easily but it is always better to book in advance especially if visiting during weekends, Thursday and public holidays. Devasthanam (Temple authorities) provide Cottages (₹200-750) for those who are performing special sevas. Hare Sreenivasa Lodge, +91 8512 279446,+91-9440591707. Pavamana Udupi Residency for AC and non-AC deluxe rooms. +91-8512-280062. Prasuna Lodge, +91 8512 279594. Sri Upendra Theertha Nilayam - Sri Raghavendra Swamy Mutt +91 8512 280071, +91 9440 591611, AC rooms for ₹750. 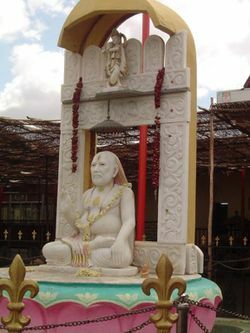 Twenty kilometres away across the state line in Raichur is a temple called Panchamukha that commemorates the spot where Sri Guru Raghavendra is said to have meditated for twelve years before Sri Anjaneya. This page was last edited on 19 January 2019, at 07:37.